115158 Size: Large, Color: Classic Black Pictured in Natural Features: -Pantyhose.-Material: 73pct Nylon, 27pct spandex - latex free.-Fabric: Opaque.-Toe type: Closed toe.-Luxuriously smooth and easy to wear.-Ultra soft for the most comfortable stocking in its class.-Lightweight and highly effective in optimizing leg health.-Special processing and a silicone blend softener make these stockings some of the easiest to put on.-Resilient yarns allow for greater durability.-Reciprocated heel and toe for better fit and durability.-Smooth design and soft texture provides softer more fashionable look with the ultimate in year-round coverage.-Condition: Chronic venous insufficiency (CVI), moderate / severe swelling, varicose veins - moderate / severe. Options: -Available in classic black and natural colors.-Available in small, medium, large and x-large sizes. 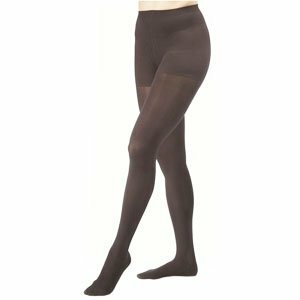 Dimensions: -Style / Length: Pantyhose.